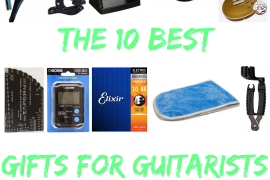 2018 has been an important year for guitar technology and we understand that it can be difficult to wade through the endless supply of information that the internet provides us with. 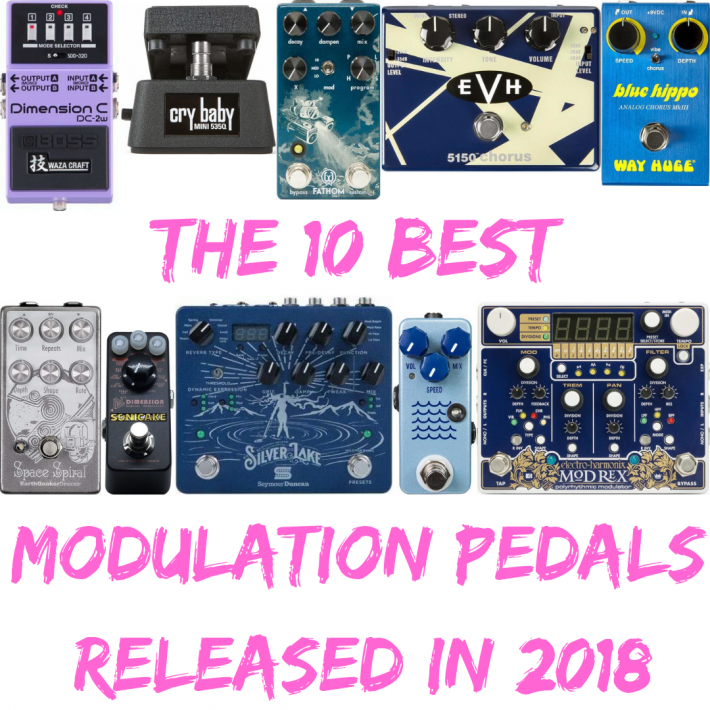 Which is why we have decided to save you the hassle and compile a list of our favorite modulation pedals to be released in 2018. Some of these are traditional sounding units, others are geared towards the strange and abstract, and some of them kind of do both. A simple way of thinking about the DC-2W would be as a chorus pedal for people who don’t like chorus. 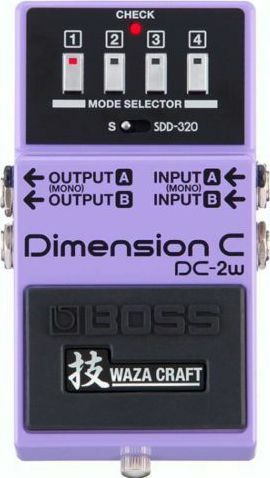 But the Dimension C is not exactly a chorus pedal, in that it does not achieve the chorusing effect by the same means as, say a Boss CH-1. The result here is a less phase-y, more natural effect more akin to what you would be able to achieve in the studio with some high end rack gear. In fact, while the S mode is designed to replicate the sound of the original Dimension C chorus pedal, SSD-320 mode unleashes the sound of the legendary SSD-320 Dimension D rack processor. As such, this pedal is something of swiss army knife of true chorus tones, much more nuanced and complex than a standard chorus box. 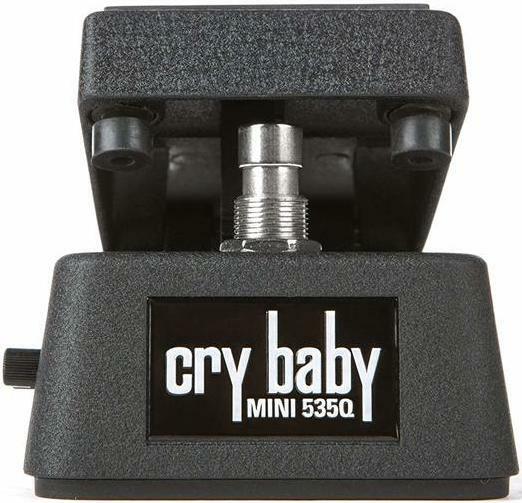 The Cry Baby 535Q is already one of the most versatile wah pedals readily available today, so what would make it better? Well, for some a smaller casing would be icing on the cake. For those of you who fall into that camp, 2018 is the year that Dunlop came through. Their Mini 535Q wah pedal comes stocked with a red Fasel inductor, 4 different frequency sweep options, a switchable boost, and of course the Q control. All of this jammed into a pedal housing that is about the size of a traditional Boss pedal. If you like being able to fine tune your wah pedals, but are a little short on space on your current board, you’re going to want to check this one out. Although chorus might not be the first thing that comes to mind when thinking of Van Halen’s legendary sound, Eddie has used plenty of chorus in his day, particularly during middle period Roth-era recordings. Diver Down, for example, is a record that is filled with all sorts of chorus-drenched sounds. Many of those original chorus sounds were created using a Roland DC-30 analog chorus/echo unit, and then later replicated in live performances first with Boss pedals and more recently with MXR pedals. 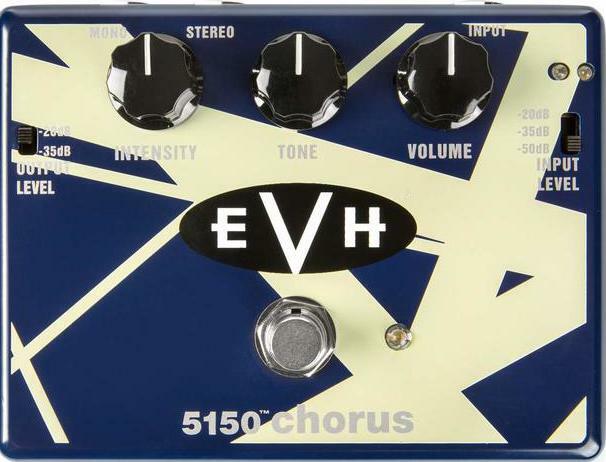 Apparently Eddie felt like he needed an option for live performance that was truer to the original, and so 2018 saw the release of the 5150 Chorus pedal. At its core, this pedal is a 3 knob chorus that has been voiced to sound similar to a Roland DC-30, but something that sets the 5150 chorus apart from its competitors are the respective input and output level switches that allow you to achieve optimum signal-to-noise performance and unity throughput gain. 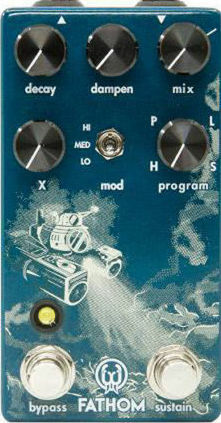 This is an uncommon feature for a mass produced pedal, but one that we would like to see more of on modulation units. This pedal also comes with the option to switch between buffered and true bypass modes. This unit is more like a reverb plugin in physical form. 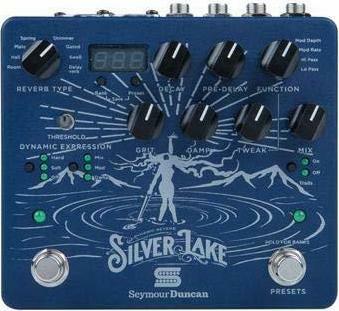 128 presets, 24-bit engine, 8 reverb algorithms, and MIDI in and thru ports make the Silver Lake Reverb the most robust pedal on this list. In addition to options for reverb type, this pedal boasts the capacity to adjust decay, pre-delay, function, grit, damp, tweak, and mix. Two footswitch buttons allow you to scroll through presets while the pedal is on or off, making onstage switching that much easier. Among the major events of 2018, the return of some of our favorites from Jeorge Tripps and Way Huge ranks very highly for us. 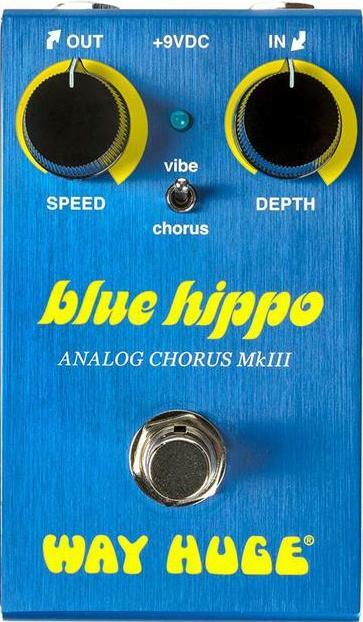 The Blue Hippo is one of the most nuanced and usable chorus pedals that we have used, and we appreciate the versatility provided by the vibe/chorus mini switch. Classic bucket brigade circuitry is at the core of this pedal’s design, so if that kind of sound is your thing, the Blue Hippo Analog Chorus will strike you as very pleasing. At its more extreme settings, this pedal can get plenty weird, but its more subtle settings are where the unit really shines. Rich ambience and impressive algorithms are at the heart of the Fathom multi reverb pedal. With the options for Hall, Plate, Lo-Fi, and Sonar reverbs, as well as a push-to-hold sustain button (like the MASH feature from TC Electronic), and a trails mode feature designed to leave your signal oozing with sweet reverb tails even after you switch the pedal off (this feature can be disengaged), this offering from Walrus Audio is a deal and a half. The interface is intuitive and the sounds are complex and sweet. One of the best things about vintage Fender blackface amps and old Vox AC30s is the smooth tremolo function that many of them came with. The downside is that those vintage models tend to be expensive, heavy, in need of service, and not as versatile as more contemporary options. To remedy this, JHS Pedals has designed their Tidewater Tremolo so that you can get that classic amp-style tremolo regardless of what kind of rig you are working with. Volume, Mix, and Speed ease the process of dialing in just the right amount of pulsations. Housed in a mini pedal enclosure, this pedal will easily fit on even the most overloaded of pedal boards. We have been having fun with this once since we got it in the spring. 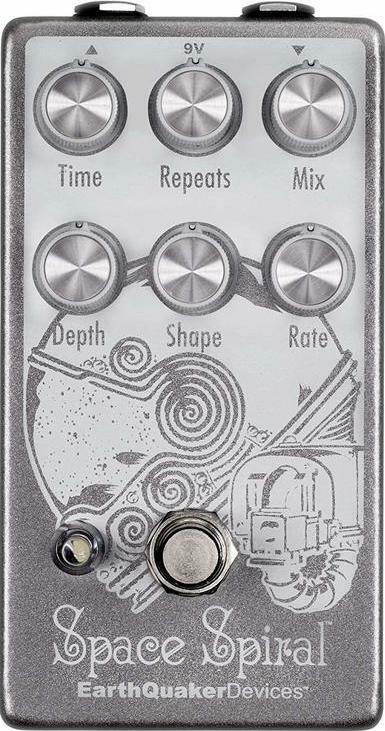 If you are into more abstract sounds and modulation possibilities, particularly those that revolve around delay functions, the EarthQuaker Devices Space Spiral V2 is for you. Though it does have a conservative side well suited to gentle slap back delay and softly modulated repeats, this pedal quickly shifts into the dreamy territory typically occupied by old tape delays and vintage oil can units. 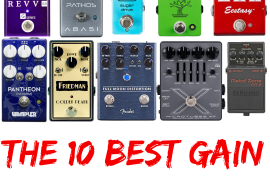 By far the most inexpensive pedal on this list, and yet also the most versatile! The 11 effects settings include a 2 Phasers, 2 Flangers, 2 choruses, 2 tremolos, a vibrato, an envelope filter, and even a downsampler/bitcrusher. All of this crammed into a mini pedal casing. Not bad at all. Mix, Depth, and Rate controls ensure maximum tweakability, and the footswitch even doubles as a tap tempo control. For those just beginning to venture into the realm of modulation effects, we recommend starting with the Sonicake 5th Dimension, as the low price/high versatility of this pedal will allow you to try out the most common modulation effects for a fraction of the price of most typical single modulation effect pedals. Perhaps more of a miniature computer than a traditional pedal, this new behemoth from EHX covers lots of modulation ground with Vibrato, Flanger, Chorus, and Phaser options, 9 tempo subdivision options for each modulation section, 4 LFO shape options for each modulation section, and up to 4 simultaneous modulation sections all synced in time. 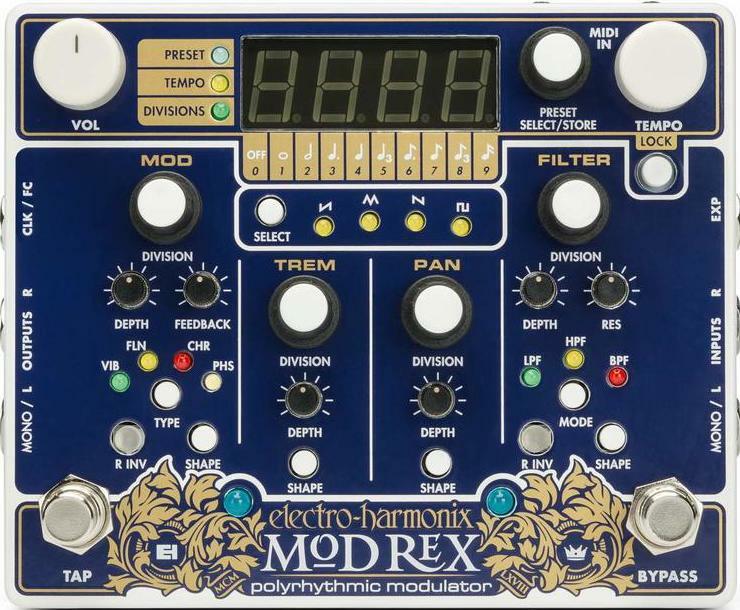 If you are looking for a multi-pedal to cover all of your modulation needs, the Mod Rex could be just what you need. Similarly, if you rely heavily on computer-based electronics for your live shows but have been searching for something a bit less cumbersome to take on the road with you, this could be an option worth testing out.